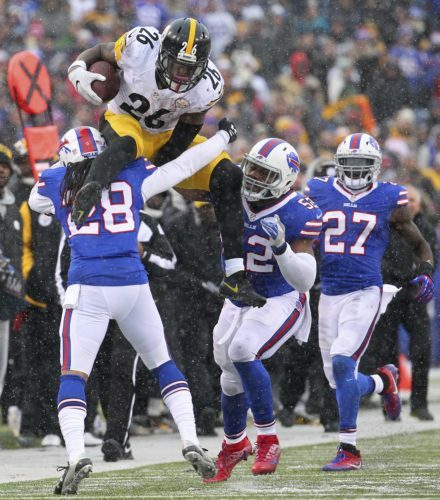 PITTSBURGH (AP) – Mike Tomlin has confidence in the Pittsburgh Steelers secondary. And the linebackers. And the defensive line. And tight end. And everywhere else his team will begin the 2016 season in Washington on Monday with guys atop the depth chart who weren’t the guys Tomlin had in mind when training camp began six weeks ago. Ladarius Green, signed to replace the retired Heath Miller, is on the physically unable to perform list with lingering health issues. Outside linebacker Bud Dupree is on injured reserve with abdominal concerns. Cornerback Senquez Golson’s second season is starting a lot like his first: on the sideline as he deals with a shoulder problem. Nose tackle Daniel McCullers is banged up and rookie Javon Hargrave – who is right there in the mix – tweaked a knee in practice on Monday. Oh, and running back Le’Veon Bell is out until Week 4 while serving a suspension for violating the NFL’s substance abuse policy. At least he’ll play this year. Talented if mercurial wide receiver Martavis Bryant will sit the entire year while serving a drug suspension of his own. For a team with Super Bowl aspirations, things could be better. Not that Tomlin wants to talk about it. It’s September after all. Things change. Players heal. For now he’s simply ready to get started. Of course he’s optimistic about the defensive backfield even with the last-minute trade with Cleveland over the weekend that brought in underachieving former first-round pick Justin Gilbert. The resume littered with positive bold-faced bullet points last year when Pittsburgh finished 30th against the pass. While it didn’t stop the Steelers from going 11-7 and pushing Denver to the limit in the playoffs, they understood upgrades needed to be made, which is why they took cornerback Artie Burns in the first round and safety Sean Davis in the second. Burns was slowed by a quad injury during camp though Davis has been every bit as adaptable as Pittsburgh imagined. He has the size to cover tight ends and the skill to be effective in the slot as part of the nickel package, where Tomlin believes the Steelers will be able to mix and match personnel depending on the situation. Pittsburgh will also lean on veteran outside linebacker Arthur Moats, thrust into a starting role while Dupree waits to see if his abdominal injury needs surgery. There’s still a chance he could return at some point, but it wouldn’t be before midseason at the earliest. So Moats and second-year player Anthony Chickillo will join Jarvis Jones and James Harrison in the outside rotation. Tomlin declined to provide specifics on how the playing time will be split, wary of an innocuous comment by outside linebackers coach Joey Porter last year in which Porter said the team would try to limit Harrison’s playing time. The five-time Pro Bowler ended up carrying a heavy workload at age 37. Things are clearer at tight end, where Jesse James finds himself the starter until further notice while Green works his way back. It’s not the role Pittsburgh had in mind for James, who remains a project as a blocker and hardly provides the downfield threat the Steelers envision for Green. Yet he also caught a touchdown pass in the red zone against New Orleans during the first-team offense’s only real extended preseason action. Consider the other options at quarterback Ben Roethlisberger’s disposal Tomlin doesn’t think James needs to be Miller 2.0. At least, not yet.